During the hackathon, we struggled and couldn't get the help we needed. Grabbing a mentor was like a hunt and not every mentor knows everything. So, we wanted to create an app that solves this problem. It allows the user to choose the nearest location and send a help request in Slack. This will ping the mentors so they can come to help the user. We built it using Slack APIs because we wanted to reach the mentors in a convenient location. Slack is a very popular team communications app. 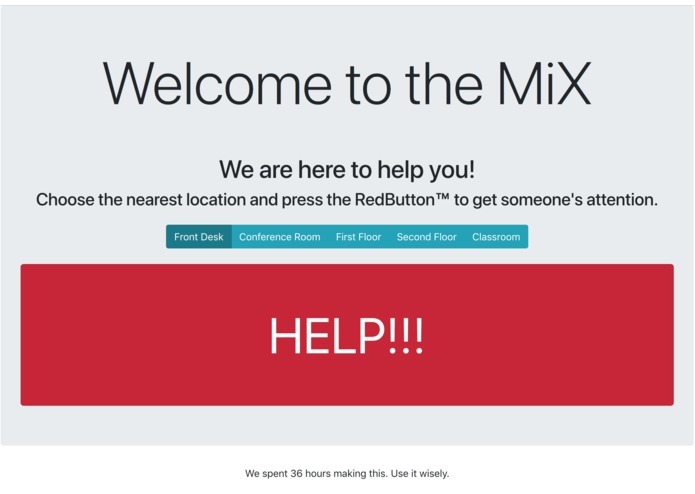 The main challenges that we faced through designing this are getting the webhook to work efficiently and send the proper information to the Slack app and changing the text based on which buttons were pressed by the user when they pressed the red button. The way we were able to stylize the web application to be clean, sophisticated, and functional without being too cluttered.